Total Motorcycle Exclusive Coverage. You saw it here first. 2004 Harley-Davidson & Buell Motorcycle Models. Every new year we all line up eagar to see what new models the manufacturers are offering up this year. After what seems like forever, the new information on the models are now trickling. Thanks to deep internet searching we offer the following information for your eyes only. Total Motorcycle is observing down to the minute all media black out information. But as soon as we are allowed to show you what we already know (and have setup on our site already), then you will be the first to know. New as of July 22: Harley Teases 2004 Motorcycles: New Sportsters, More VRs Long-awaited upgrade for Sportster line and new V-Rod model announced. By Art Friedman. Harley-Davidson’s potent VR liquid-cooled twin will power a less pricey version of the V-Rod in 2004. Entirely new Sportsters and an additional VR-powered motorcycle were promised in a Harley-Davidson press release offering a glimpse of its 2004 model line. Those models were shown to Harley’s dealers during the past week and a couple of loyal readers have offered some comments on what’s coming, although Harley has not offered us any details directly. First, the new VR-powered model is apparently simply a rather minor change to the V-Rod, not a significantly new model. Some of the slick (and expensive) polished and plated parts of the original V-Rod have been replaced by paint or other lower-cost finishes. The basic bike — ergonomics, chassis details, etc. — are apparently unchanged, but you will have a color choice and, we assume, pay less for this variation. When the VRSCA V-Rod was introduced for 2002, it was obvious that the engine would be used in additional motorcycles, and we have been waiting for a machine that uses the impressive liquid-cooled 1130cc engine in a better handling, more ergonomically friendly application. There was lots of speculation about a touring model for 2004, and we have some reliable reports that a shaft-drive version is in the offing, but neither of those possibilities are reality yet. The Sportsters, Harley-Davidson’s oldest engine family, have been regarded as overdue for a major revamp. Though they are popular and affordable, the unbalanced 883 and 1200cc machines vibrate heavily and show their ages in other ways. Sales have reportedly been slow recently — or at least Harley-Davidson dealers seem to have plenty in stock, perhaps because of increased production. From what we gather from an email exchange, the new Sportsters have the same basic engines as previous models. However, the chassis is all new, with a substantially different layout, new brakes and suspension and (drum roll) rubber mounts for the engines. These should make the 2004 motorcycle much more comfortable and exorcise many vibration-related problems. However, the new bikes “still look just like XLs should,” according to one source. The newest Harley Sportster is reportedly a 1200cc version of the XL883R shown here (but with the new chassis). 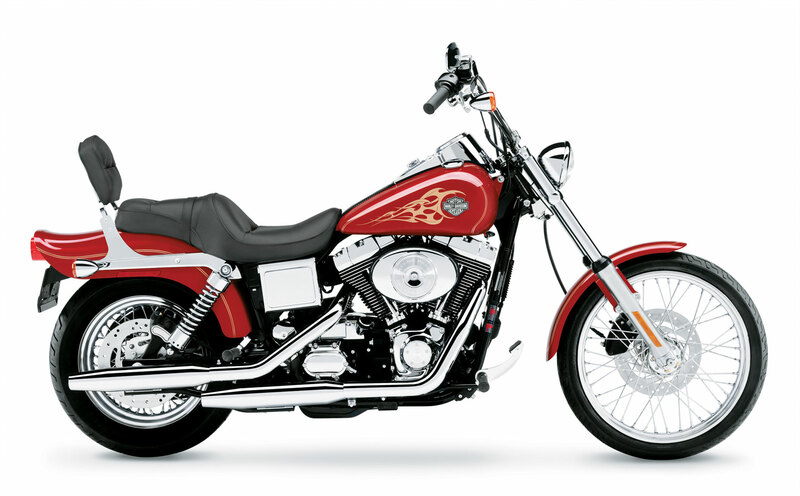 One source says that it replaces the Sportster 1200 Sport, though the other did not think so. We also have conflicting reports on whether the basic 1200 has been discontinued. It sounds like the Sportster Custom, in one or both displacement versions, will finally have the fat tank that we expected to see a few years ago. The new frame design apparently allows the larger tank. One of our sources with access to the dealer materials says he is trying to send us scans of the new models, and we will post them if we get them. New as of July 1st: As Harley-Davidson kicks off its second century, the Motor Company is preparing for an exciting new chapter in the Company’s history. Yesterday, Harley-Davidson introduced a completely redesigned XL Sportster line and a new model in the VRSC V-Rod family to the dealer network at the company’s summer dealer meeting, held this year in Las Vegas. Harley-Davidson will unveil the entire 2004 model line-up to the general public on Thursday, August 28 during the Company’s 100th Anniversary celebration in Milwaukee, WI. The Company extended the 2003 model year to 14 months in order to meet anticipated demand for its 100th Anniversary models. Shipments of 2004 motorcycles to the worldwide dealer network will begin in September 2003. For the 2004 model year, Harley-Davidson recently introduced to their dealer network a completely redesigned XL Sportster line and a new model in the VRSC V-Rod family. The Motor Company’s summer dealer meeting was held this year in Las Vegas. Also introduced were two new Buell models, Firebolt XB12R and the Lightning XB12S, each featuring a new 103-horsepower engine. The two new models will join existing models – Firebolt XB9R, Lightning XB9S and Buell Blast – as part of Buell’s 2004 line. Changes to the Lightning XB9S, Lightining Low XB9S, and Firebolt XB9R were also announced. All 2004 Buell motorcycles will be covered by a two-year, unlimited mileage warranty replacing the previous one-year warranty. Buell Motorcycle Company offers sportbike riders a wallop of American muscle with the introduction of the Buell Firebolt XB12R, a new model that mates the intuitive handling and innovative technology of the original Firebolt XB9R with a torque-monster engine — a 1203cc air/fan and oil-cooled V-Twin rated at 103 peak horsepower and 84 ft. lbs. of tire-twisting torque. The heart of the new Buell Firebolt XB12R is its XB1200 engine — a 1203cc light-weight 45-degree, air/fan and oil-cooled, fuel-injected V-Twin based on the 984cc engine that debuted in the Firebolt XB9R. The XB12R engine achieves its displacement boost through an increase in stroke, from 3.125 inches to 3.812 inches. Both engines have a bore of 3.5 inches. The compression ratio is 10:1. 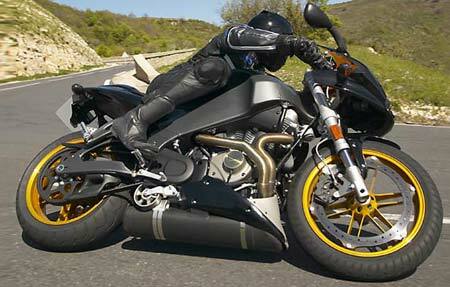 To further broaden its torque band, the new XB1200 engine is equipped with Buell InterActive Exhaust. An electronic actuator activates a butterfly valve housed in the muffler to adjust back-pressure by alternating between two gas flow paths. The engine ECM monitors engine speed and throttle position while activating the valve to optimize torque and horsepower for the riding condition. At wide-open throttle, for example, the valve is opened at low rpm to reduce back-pressure so the engine can gain rpm quickly. The valve closes in the mid-range to increase acceleration torque, and then opens again at high rpm to maximize horsepower. Buell InterActive Exhaust enhances the rich, throaty rumble of the Firebolt exhaust tone. As part of the system, header pipe diameter is increased from 1.50 inches to 1.75 inches. The intake throttle body diameter is increased from 45mm to 49mm, and a stiffer clutch spring and new 14mm pitch aramid reinforced Hibrex drive belt are fitted to handle the torque demands of the 1203cc engine. The primary drive ratio is lowered from 1.68:1 to 1.50:1. Gear ratios in the five-speed transmission remain unchanged. The XB1200 engine is the same physical size as the XB984 engine, so it offers an even better torque-to-weight ratio. High-flow heads and lightweight valve train give the engine crisp throttle response, but power delivery is smooth and steady, thanks to the engine’s broad torque band, Buell InterActive Exhaust, and lash-free belt drive. The Firebolt XB12R is the latest expression of the Buell Trilogy of Tech design philosophy, focused on three elements: frame rigidity, mass centralization, and minimal unsprung weight. The rigid aluminum frame is a light-weight, multi-functional structure that serves as both a solid foundation for the motorcycle and as a 3.7-gallon fuel reservoir. Using the frame to carry fuel significantly lowers the center of gravity and reduces the moment of inertia, both of which improve the bike’s reaction to rider input. Mass centralization and a low center of gravity are further enhanced by locating the muffler below the XB1200 engine. The massive aluminum swingarm doubles as the engine oil reservoir, and is supported by an adjustable Showa shock absorber. The final key to the uncanny agility of the XB12R Firebolt is a chassis geometry that combines a 21-degree fork angle and 83mm of trail with a compact, 52-inch wheelbase. Fifty-two percent of the bike’s mass is carried on the front wheel. The result is a sport motorcycle with the quick reflexes of a GP racer, a bike that will flick into a corner instantly and hold a line that other sportbikes can’t touch. If Firebolt performance and technology are not enough to make its rider the center of attention, its styling will finish the job. With durable Surlyn bodywork offered in either Midnight Black or Racing Red, the XB12R features a Graphite Grey frame and swingarm, Black-and-Amber tail and airbox graphics, Magnesium Tone clutch and cam covers, and a wild Amber windscreen. The cast aluminum wheels receive an exclusive, high-gloss translucent paint process that produces a beautiful Amber color with natural variations and depth. The perforated seat cover completes the premium look. Premium components. Razor-sharp reflexes. A bottomless supply of torque. 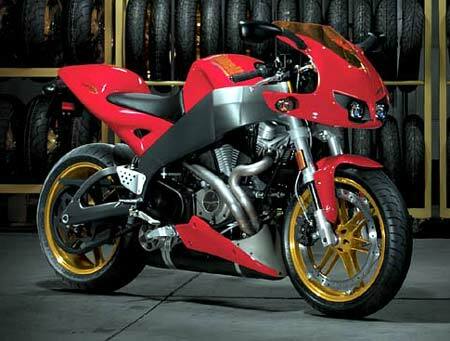 The Buell Firebolt XB12R was built to dominate the Sportfighter category. The new Buell Lightning XB12S offers a new level of brute performance, a volatile blend of dirt track attitude and the latest technology powered by a new XB1200 V-Twin engine tuned to pound out a mountain of torque. Designed in the spirit of the original American streetfighter, the legendary Buell Lighting S1, the new Lightning XB12R offers upright ergonomics, uncompromised agility and a big, rowdy engine that puts out the kind of power street riders lust for – 103 peak horsepower and 84 ft. lbs. torque. 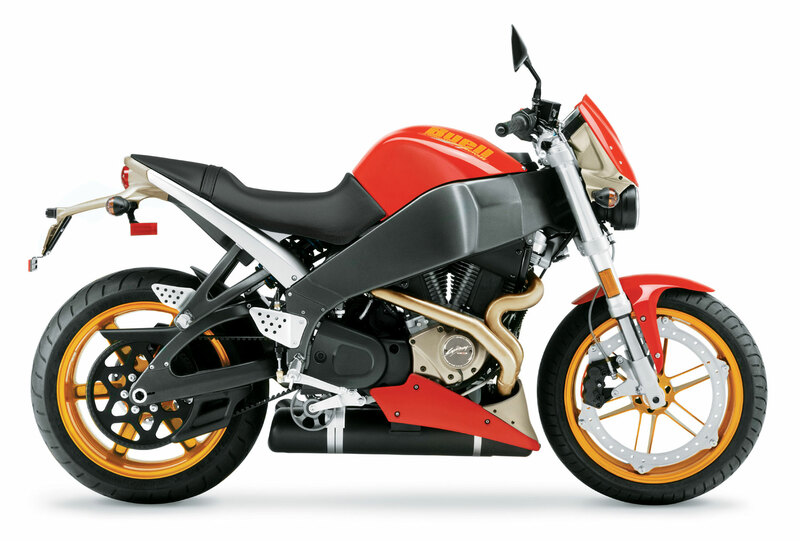 The new Buell Lightning XB1200 engine is a fuel-injected 45-degree, air/fan and oil-cooled, V-Twin. The engine is based on the XB984 engine from the Buell Lightning XB9S, stroked from 3.125 inches to 3.812 inches to achieve a new displacement of 1203cc. The bore remains 3.5 inches, and the compression ratio is 10:1. The intake throttle body diameter is increased from 45mm to 49mm, and a stiffer clutch spring and new 14mm pitch aramid reinforced Hibrex drive belt have been fitted to handle the torque demands of the 1203cc engine. The primary drive ratio is lowered from 1.68:1 to 1.50:1. Gear ratios in the five-speed transmission remain unchanged. To keep the torque band fat, the new XB1200 engine is equipped with Buell InterActive Exhaust. An electronic actuator activates a butterfly valve housed in the muffler to adjust back-pressure by alternating between two gas flow paths. The engine ECM monitors engine speed and throttle position while activating the valve to optimize torque and horsepower for the riding condition. At wide-open throttle, for example, the valve is opened at low rpm to reduce back-pressure so the engine can gain rpm quickly. The valve closes in the mid-range to increase acceleration torque, and then opens again at high rpm to maximize horsepower. Buell InterActive Exhaust enhances the rich, throaty rumble of the Lightning exhaust tone. As part of the system, header pipe diameter is increased from 1.50 inches to 1.75 inches. The XB1200 engine is the same physical size as the XB9S engine, so it offers an even better torque-to-weight ratio. High-flow heads and lightweight valvetrain give the engine crisp throttle response, but power delivery is smooth and steady, thanks to the engine’s broad torque band, Buell InterActive Exhaust, and lash-free belt drive. The Lightning XB12S is designed to excel in the cut-and-thrust world of urban streets and aggressive, back-road twisties. Start with an ultra-short 52-inch wheelbase and 21-degree fork angle. Wide, flat handlebars maximize rider input in the turns. The massive aluminum frame and swingarm are designed to provide exceptional chassis rigidity, and both do double-duty. The frame carries 3.7 gallons of fuel, while the swingarm acts an the engine oil reservoir. In each case, this helps lower the bike’s overall center of gravity. The muffler is located below the XB1200 engine for the same reason. The result is a motorcycle that’s willing to change direction the instant rider input occurs. It stops well, too, thanks to the Buell Zero Torsional Load front brake that mounts a 375mm rotor near the wheel rim, rather than on the hub. Gripped by a six-piston caliper, braking forces are transferred directly to the rim, virtually eliminating torsional load on the front wheel. Braking response and feel are outstanding, and a very lightweight, six-spoke cast aluminum wheel reduces unsprung weight and steering inertia. The front is supported by a fully adjustable 41mm Showa inverted fork. From its flyscreen to its chopped-off tail, the Lightning XB12S sets the standard for streetfighter attitude. Minimal Surlyn bodywork is offered in Midnight Black or Racing Red to offset a new Graphite Grey frame and swingarm, as well as Translucent Amber wheels. The ventilated tail section is Hammertone Silver, while Magnesium Tone is used on the primary cover, cam cover, license plate bracket and front module. The seat has a new textured cover. The Buell Lightning XB9S is back as America’s middleweight streetfighter. Inspired by dirt-track racers, the Lightning XB9S offers comfortable, upright ergonomics and the kind of no-nonsense performance a serious rider can use to conquer the back-road curves and dominate on the street. The heart of the Lightning XB9S is its XB984 V-Twin engine. Tuned specifically to put down the kind of flexible power you need on the street, the 45-degree, 984cc engine is air/fan and oil-cooled for light weight and fuel injected for crisp throttle response. A short stroke and light flywheel helps the engine snap to its 7500 rpm redline, but it also delivers outstanding torque throughout its broad powerband. Peak output through a smooth aramid reinforced Hibrex drive belt is 92 horsepower and 70 ft. lbs. of torque to lead in torque-to-weight ratio in its class. The Buell Uniplanar engine mounting design reduces vibration and makes the engine a stressed member within the very rigid aluminum frame. An equally rigid aluminum swingarm and 41mm Showa inverted fork work to keep the Lightning on course in the tightest turns. The XB9S flicks into corners without hesitation, thanks to an ultra-short 52-inch wheelbase and 21-degree fork angle. Wide, dirt-tracker handlebars give the rider outstanding steering leverage. Like all Buell motorcycles, the Lightning XB9S is designed around the Trilogy of Tech philosophy: frame rigidity, mass centralization and minimal unsprung weight. To lower the center of gravity, fuel is carried within the frame, while the engine oil reservoir is located within the swingarm, and the muffler is located below the engine. The Buell Zero Torsional Load braking system utilizes a single 375mm brake rotor mounted near the wheel rim. Braking forces are transmitted directly to the rim, virtually eliminating torsional load to the front wheel and enhancing overall brake feel and control. The ZTL brake permits the use of a very lightweight, cast aluminum front wheel, reducing unsprung weight and steering inertia. Dirt-track racers inspired the naked, aggressive styling of the Lightning XB9S. The flyscreen perched over dual headlights mimics the racer’s numberplate. The tail is clipped short and trimmed with a ventilated tail section. Durable Surlyn bodywork is available for 2004 in Midnight Black or Sunfire Yellow with three-dimensional chrome graphics. The Buell Lightning Low XB9S delivers uncompromised street performance in a package that will be more comfortable for riders who prefer a lower seat height. The Lightning Low XB9S seat height is just 28.6 inches (1.5 inches lower than the standard XB9S), achieved by altering the front and rear suspension and reshaping the seat pad. The Lightning Low retains the responsive handling and exhilarating performance of the standard Lightning XB9S while offering a lower seat and lower center of gravity. The innovative Firebolt XB9R is designed to deliver a new level of performance in the real world – the twisty backroads and sweeping mountain byways that challenge serious, sophisticated sportriders every day. To meet that mission, the XB9R offers a chassis that responds instantly to rider input and the XB984 V-Twin engine that delivers a smooth, torquey powerband you can really use on the road. The Firebolt XB9R was developed around the key concepts of frame rigidity, mass centralization and minimal unsprung weight—the three legs of the Buell Trilogy of Tech design philosophy. The literal backbone of this design is a very rigid aluminum frame that also serves as the bike’s fuel tank. Carrying fuel within the frame offers a significant reduction in overall center of gravity over a traditional fuel tank mounted on top of the frame. The muffler is located below the engine to further lower the center of gravity (CG) and centralize component mass. The patented Buell Uniplanar engine mounting system reduces vibration to the rider and incorporates the engine as a stressed member of the chassis, further enhancing overall stiffness. The massive aluminum swingarm also serves as the reservoir for engine oil, another innovative idea that helps lower the CG. Handling that’s so quick and precise it almost seems intuitive. The Firebolt XB9R inspires the kind of confidence that carries a good rider deeper and faster into the turns. It starts with a chassis geometry that looks extreme on paper but really works in the real world-an ultra-short 52-inch wheelbase and a 21-degree fork with 83mm of trail. The rigid frame and swingarm, the chassis geometry, and the low center of gravity combine to give the Firebolt the ability to deliver dominating performance in the corners. Twist the throttle, and the Firebolt XB984 engine revs high and hard. This 984cc, 45-degree V-Twin has Dynamic Digital Fuel Injection (DDFI) for crisp throttle response and is air/fan and oil-cooled to keep weight and complexity to a minimum. A short stroke, lightweight valvetrain and high-flow heads help this engine snap right to its 7500 rpm redline, but its broad torque band means there’s always power on tap when you need it. The engine is rated at 92 peak horsepower and 70 ft. lbs. of torque and delivers the highest torque-to-weight ratio in its class. A five-speed gearbox feeds a smooth, clean belt drive. Hold on, this information is being compiled and designed. This page is being up dated every ASAP as new information is added.